No, I am not describing my husband! But if you love mushrooms then you know what I am talking about. Whenever I make this soup I am often asked for the recipe. You will be surprised how easy it is to make. I love how recipes with the least ingredients can taste quite complex. Mushrooms do just that. You can make this soup a day in advance of when you want to serve it. This gives the soup some time to develop great flavours. And if you really want to up your soup into pretentious (and deliciousness), drizzle a few tiny drops of truffle oil over the soup just before serving, (or truffle salt if you have some). And please do not omit the dried wild mushrooms, they are loaded with deep flavours and are an essential to this soup. I use a mix of dried porcini, oyster and shiitake. You can usually find dried mushrooms in the produce section at the grocery store in small packages. Any combination of fresh mushrooms work in this recipe. So, invite some friends over and enjoy this soup with people you love! And don’t forget to give your hubby seconds! When buying truffle oil is important to distinguish between real and synthetic. Most brands make a canola or olive oil blend with truffle flavouring. Real truffle oil is made by adding edible truffles to an olive oil and allowing the flavours to infuse over several days. Look for a high quality truffle oil and be prepared to pay for it. But don’t worry when you see how small the bottle is; you only need a few drops or a drizzle to experience the intense smell and delicious taste. Oops…I just noticed that I forgot to drizzle the truffle oil for the photo! 1. In a large saucepan, melt 2 tablespoons butter or olive oil over medium heat and add the onion, celery and garlic. Cook for 5 minutes until the onion is soft and translucent. 2. Then add the fresh mushrooms, dried mushrooms (with the water they were soaking in, taking care not add any of the dirt which may be in the bottom), carrots, thyme and more oil or butter if necessary. 3. Let the mixture cook over medium heat for about 8 to 10 minutes taking care that the onion doesn’t take on any brown colour. 4. Stir in the water and bring to a boil. 5. Immediately reduce the heat and simmer (covered) for about an hour. 6. Let soup cool for a few minutes then transfer to a blender or food processor and carefully blend at high speed until smooth. Do this in stages and remember to hold the blender lid down. 7. When blended, return the mix to the pot, season with salt and pepper, and bring up to a simmer again. Add the sherry, mix well, and serve immediately with a drizzle of truffle oil and a sprinkle of fresh chives. I do not blend the whole pot of soup, I do about half the soup as I like my soup to have some texture and some sliced mushrooms to bite into. I like to make this soup a day ahead, I find the flavours more intense. But it is delicious the same day too. If you are making in advance you may need to add a bit of water when reheating to thin out the soup. Cauliflower and carrots become the most delicious colour when cooked together and because we eat with our eyes you will love the deep orange hue of this soup and of course the simplicity of taste. This soup is quick and easy to make and is dairy-free. Separate the cauliflower florets from the stalk and cut into smaller pieces, cut the remaining stalk into small bite-sized pieces. Prepare the leeks, cut off the dark green bottom and discard. Coarsely chop the leeks. Add the olive oil to a medium sauce pan over medium heat. Stir in the onions and garlic and cook until the onions soften, stiring occasionally. Add the leeks and cook for a few more minutes. Then add the chili powder and cook until fragrant. Add the cauliflower, carrots, thyme and water and bring to a boil. Then lower the heat and let the soup simmer until all the vegetables are soften, about 20 to 30 minutes. Using a blender or food processor puree as much or the soup as you want to the consistency you like. I like to blend most of the soup. If the soup is to thick you can add more water. Taste and add the salt and pepper. Serve with chopped almonds, fresh sprouts and a dash of your favourite hot sauce. Can be made ahead for the freezer. The delicious soup at Les Mauvais Garçons. Paris is a city of iconic landmarks and classic foods. We indulged in both. The Eiffel Tower and Beef Bourguignon, Notre Dame and Soupe de Poisson, The Left Bank and Steak Frites, Musee d’Orsay and Escargots, The Champs Elysees and Macarons… you get the idea. But where do you eat good onion soup in Toronto? I grew up in the 70's and memories of onion soup was eaten at Jacques Omelettes, Gaston's and Le Papillon. If you happen to be in Paris try the onion soup at Les Mauvais Garçons in Le Marais, it was so incredibly good. What I liked best about this soup was that it was not drowning in cheese and soggy bread. I could taste the dark rich broth, caramelized melt-in-your-mouth onions and it was topped with a slice of baguette and nutty melted Gruyere. I have been thinking about this soup since coming home and how to make it. The soup in Paris was made with beef broth, mine is vegetarian and but with a few surprise ingredients my soup is almost as rich and delicious. It's nice to have memories and a big bowl of home made onion soup -- home sweet home in Toronto. 3 lb onions,( about 5 large), cut in half and thinly slice, I use yellow onions. Add the butter and oil into in a large pot over medium-high heat. When the butter has melted add the onions, garlic and salt, cook for 5 minutes, stirring often. After five minutes turn the heat to low and cook the onions for 50 to 60 minutes. You only need to stir the onions enough that they do not stick to the bottom of the pan. I check the onions about every 8 - 10 minutes giving them a stir. Slowly the onions will began to caramelize. Exact cooking times will vary, this may happen sooner or you may need to give the onions a bit more time. Add the water or broth, thyme, bay leaf, sherry, molasses and mustard. While the soup is simmering I like to puree about 2 cups of soup in a blender, then return back to the pot. This will make the soup a bit thick and creamy. This step is optional. Slice the baguette in one inch slices and place on a lined baking sheet. Top with grated cheese and broil until cheese has melted. Ladle soup into six bowls. Toss each with the toast. This soup will also be delicious made as onion soup au gratin - just remember to ladle the hot soup into ovenproof bowls, add a thick piece of toasted baguette and as much cheese as you like. Put the bowls on a lined baked sheet and place under the broiler until cheese is melted and crusty brown around the edges. Serve immediately. To make this soup vegan omit the butter and cheese. If you have time make it a day before you plan to serve to let the flavours mingle together. A watched pot does not boil. 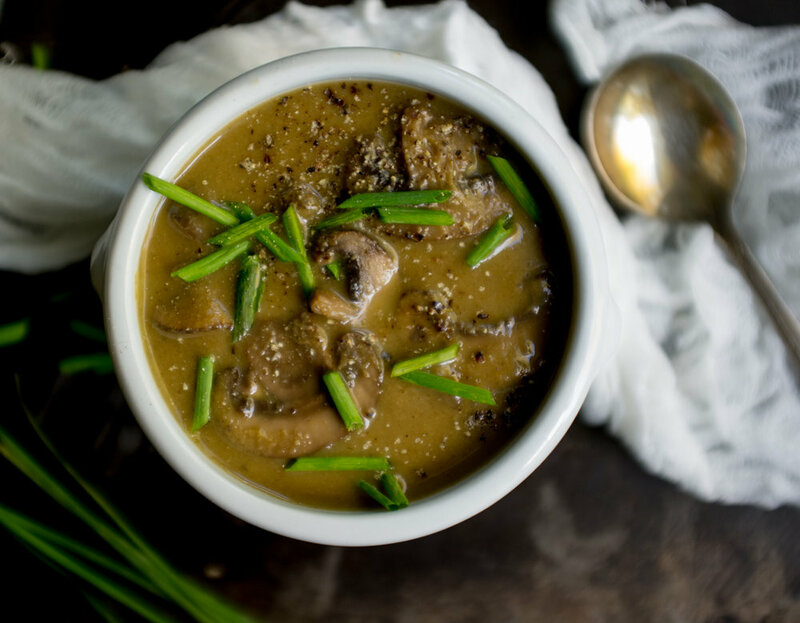 Mushroom Barley and Yellow Split Pea Soup. 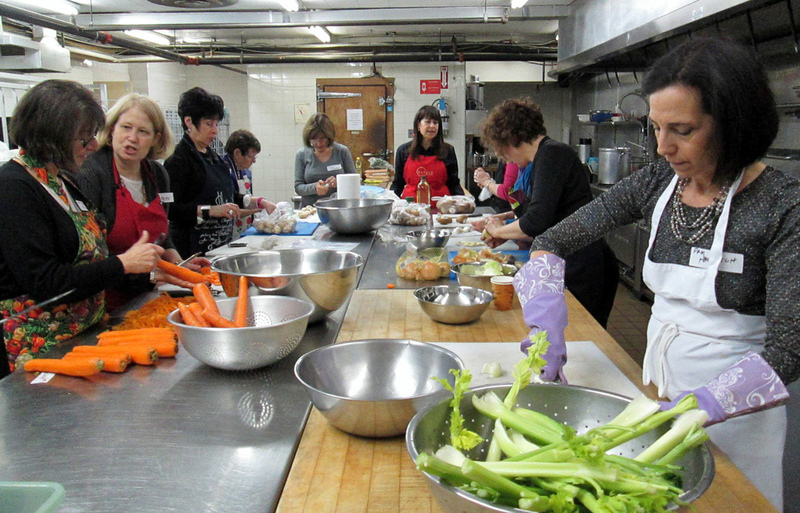 Earlier this week I had the honour of volunteering at Holy Blossom Temple to help organize an amazing group of women make soup for the Bikur Cholim Committee. The evening was organized by my sister-in-law Jill Hertzman, along with a dedicated group of volunteers. Today's post is by Jill. Was it because our pot was too large? Did we fill it with too much water? Was the burner working properly? In the end, it did come to a boil, but the hour was late and Marla was mopping her worried brow. Actually, there were four very large pots of the most delicious mushroom barley and yellow split pea soup, colourful and fragrant. 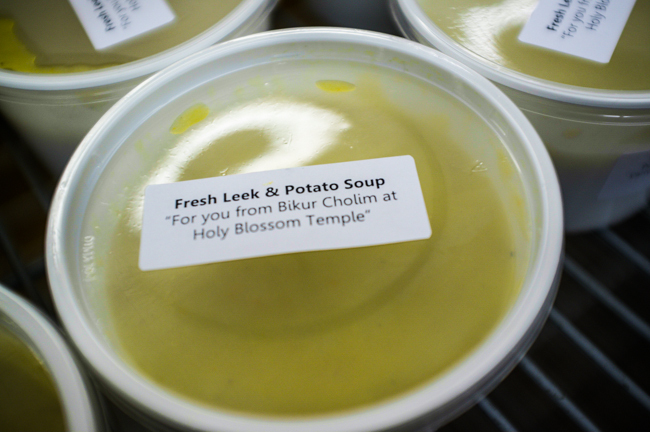 Our 6th Annual Holy Blossom Temple Bikur Cholim Soup Brigade was held on November 10, 2014, with Marla as our returning chef. For the record, Marla has attended all the soup nights, led two, and has cooked for our committee for many years. Bikur Cholim means visiting the sick, and in Jewish tradition it is an “obligation without measure whose reward too is without measure”. One of the ways we do this mitzvah is to prepare soup and fill our synagogue’s freezer (a tight fit this year as we made 125 500 ml containers). Then we always have on hand some nourishment to offer to congregants who are frail, elderly, or unwell, or to those families in crisis. There were 20 of us chopping, seasoning, stirring, and tasting. And there was food for the mind, too. Rabbi Michael Satz led us in text study, a chapter from the Code of Jewish Law, which details the proper way to visit so there is dignity, sanctity, and comfort. These guidelines are over a hundred and fifty years old, yet very relevant for today. There is no doubt that you will enjoy the recipes -- in good health, we hope. Here is the link to Holy Blossom’s Bikur Cholim if you would like to know more. In a large saucepan, heat oil over medium-high heat. Add onions, carrots, celery, garlic and pepper; cook, stirring, for 6 to 8 minutes or until vegetables are softened. Stir in split peas and broth or water. Bring to a boil. Reduce heat to medium-low, cover and simmer, stirring occasionally, for 35 to 40 minutes or until peas are very tender. Transfer 1 to 2 cups of the soup solids to food processor. Add a bit of water if to thick and purée until smooth. Return purée to saucepan and stir in the dill. Simmer, stirring often, for 5 minutes to blend the flavors, and thinning soup with water if too thick. Taste and add more salt or pepper if needed. Serve sprinkled with more dill or parsley. Heat the oil in a large soup pot over medium heat. Add the onion, carrots, celery and garlic; cook and stir for 6 to 8 minutes or until vegetables are softened. Stir in mushrooms and continue to cook for a few minutes. Add the vegetable broth or water, barley, salt and pepper. Bring to a boil, then reduce heat to low. Cover and simmer until barley is tender, about 50 minutes. Taste and add more salt or pepper if needed. I love coming home on Thursday's. 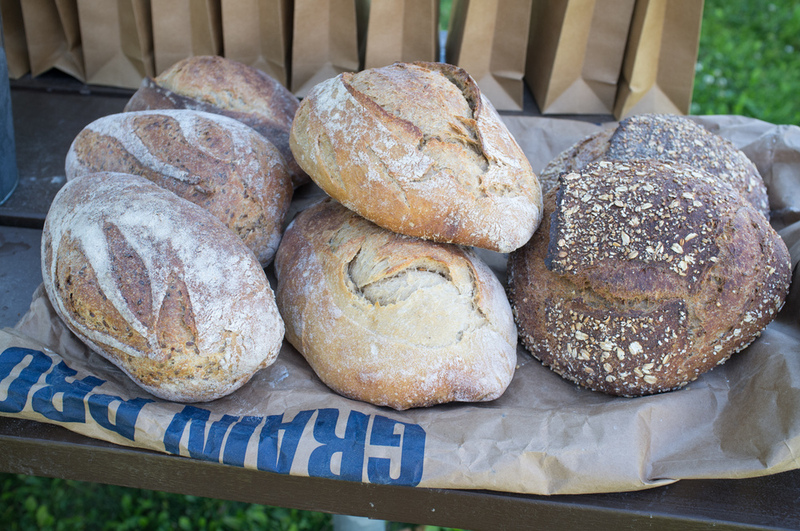 This beautiful bag is waiting for me at my front door from Fresh City Farms. My Fresh City Farms bag, I wonder what I will get this week. Some of the goodies in my bag... mini red potatoes, baby bok choy, mushrooms, arugula, garlic and parsnip, all fresh and beautiful. I made a simple soup with the parsnip, added a few of the mini potatoes and lots of garlic. While the soup simmered I thinly sliced some of the parsnip, tossed them in oil and then baked in a hot oven. Dinner is served. Parsnip in my bag that I used for this recipe. 1. Preheat the oven to 300 F. Using a very sharp knife or a mandolin, cut thin the parsnip into round thin slices. Make sure the parsnip are very dry, you may want to take out the extra moisture by placing the parsnip slices on some paper towel. When dry, place parsnip in a large bowl and toss with the sunflower oil. 2. Arrange the parsnip in single layers on 1 to 2 baking trays lined with parchment paper. Roast in the oven for 25-30 minutes, turning halfway, until golden and crisp. Sprinkle with sea salt while warm and serve with the soup. fresh chives or any fresh herbs for garnish, (I forgot to add them in the photo). In a large sauce pan, sauté the onion and garlic in the olive oil until soft. Add the parsnips and carrots and thyme and continue cooking for 1-2 minutes. Add the vegetable broth, water, a big splash of white wine, salt and pepper and simmer for 20-25 min until everything is tender. Take 3/4 of the soup and blend until smooth with a blender and stir back into the remaining soup. If the soup seems a little too thick, add more water and simmer for anothe 5 minutes. Check for seasonings, adding more salt and pepper if needed and garnish with fresh chives or any fresh herbs you have. Toronto has a farm in the city, smack right in Downsview Park, really, you can see Keele Street in the background., Gordy and I toured the farm lead by Fresh City Founder Ran Goe. 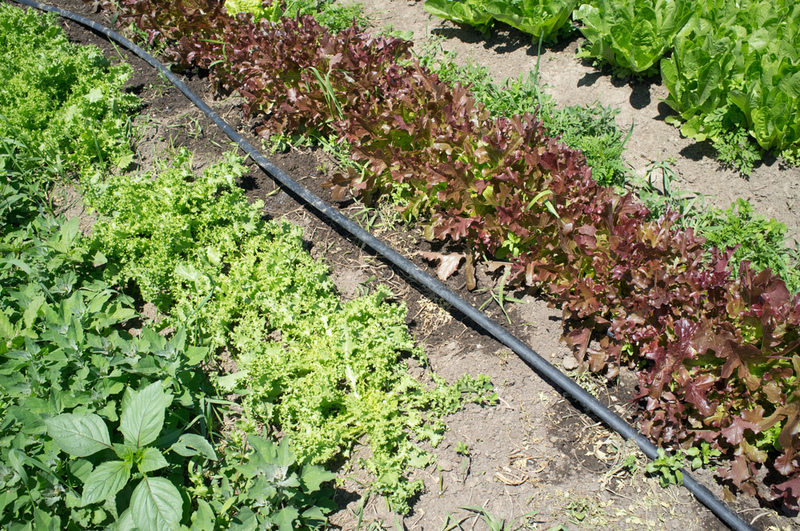 There is a greenhouse, a fish-fuelled food aquaponics and rows and rows of greens, herbs and veggies. 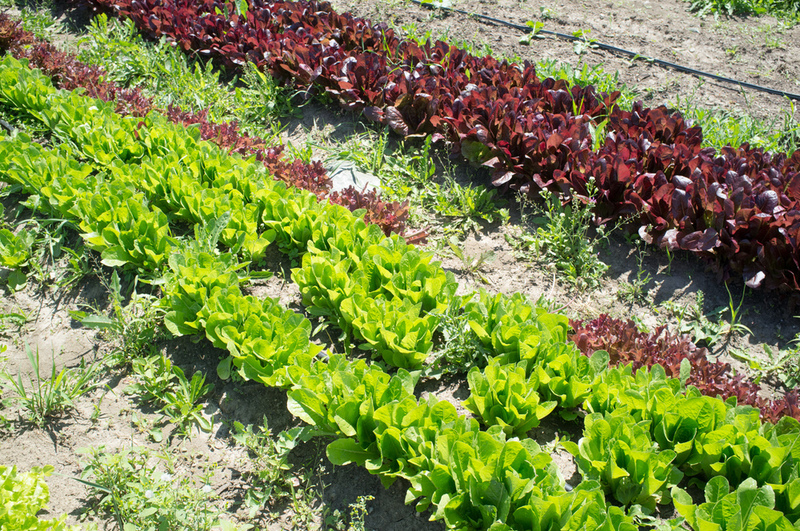 They use certified organic seeds, potting mixes, compost, fertilizers and sustainable methods of farming. I just love that it is local, organic and delivered. This is a perfect recipe to make when you have lots to do, such as holiday shopping and you just don’t feel like doing it. This recipe has lots of slicing, dicing and chopping to keep you busy. My instructions are very simple. Get Gordy to build a fire. Then eat and enjoy while watching your favourite TV show. I took the photo and realized I forgot to add the peas! Cooks Notes: Read the recipe before you start. This is a one-pot meal. Add the mirepoix and sauté, stirring frequently, until the vegetables begin to brown, about 10 minutes. Add the portobello and cremini mushrooms, raise the heat to medium-high, and sauté about 10 minutes. Add the garlic, rosemary, and thyme and cook for a few seconds until you can smell the herbs. Add the wine, vegetable stock, salt, tomatoes, bay leaf, carrots, parsnip, turnip and potatoes and bring to a boil. Reduce the heat and simmer, partially covered, until the carrots, parsnip, turnip and potatoes are tender, about 35 minutes. Mix the cornstarch with water to form a smooth paste. Stir the paste into the stew and cook until the liquid thickens for about 2 minutes. Stir in the peas and cover. Just before serving stir in the parsley, discard the bay leaf. …take all these “ingredients” and what do you get? 4 stock-pots of delicious soup! 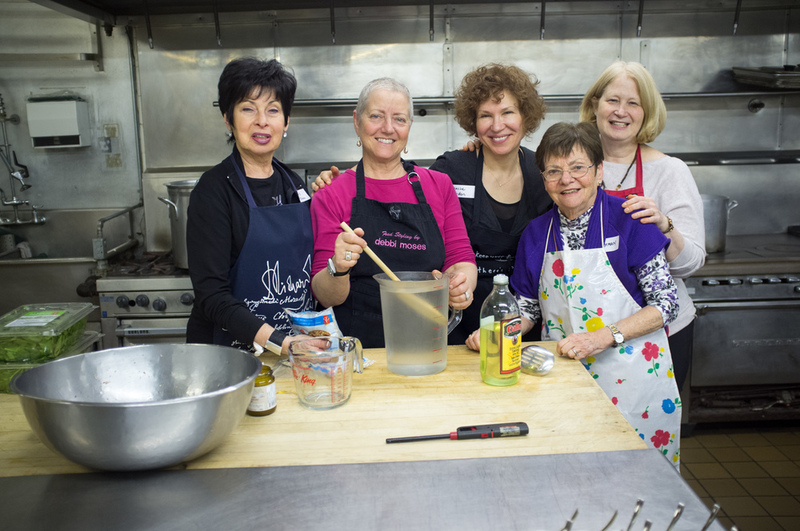 I was thrilled to have the honour of leading a group in women in soup-making for the Bikur Cholim Soup Brigade evening at Holy Blossom Temple. 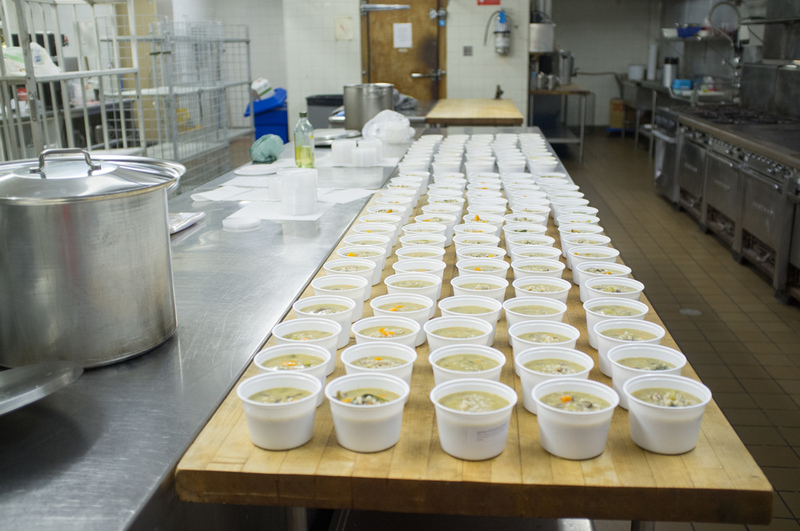 Bikur Cholim is Hebrew for “visiting the sick”, and what we did was chop, dice and stir two big batches of soup. While the soup simmered the room filled up not only with delicious cooking smells, but the warmth of people working together and a Talmud study session lead by Rabbi Teri Appleby. We all left that evening with a good feeling in our hearts, leaving behind 100 containers of some great-tasting soup that will help warm some people over the coming winter months. Heat the oil in a large soup pot over medium-high heat. Add the onion and celery, sauté until soft. Add the garlic and continue to cook for another few minutes or until the garlic is fragrant. Add the water and tomatoes with the juice. Then add the vegetables, the thyme, sage, salt and pepper. Add the mashed and whole beans. Simmer for 30 minutes or until the vegetables are soft. Taste and adjust seasonings, you may need more salt and pepper. Rinse the leeks and slice them thinly. Dice the potatoes, carrots and celery. Heat the oil in a large stockpot, sauté the leeks for a few minutes. Add the onion and garlic and continue cooking until onions are soft. Add the potatoes, carrots and celery. Add the water, salt, thyme and bay leaves. Simmer until the vegetables are very soft, about 20 minutes. Puree soup in blender or with hand blender. Cooks Notes: Both theses soups are great basic recipes. You can add some little meatballs, (cook meatballs in the oven then add to the soup). Add a parmesan rind while the soup is simmering. Drizzle some pesto over the soup just before serving. Garnish with some crumbled goat cheese or sharp cheddar. Toast some bruschetta with a little olive oil for dipping. Make the soup creamy with some cream or milk. Or for an Asian twist add a tin of coconut milk and a dash of curry powder and a chunk of ginger (omit the thyme and bay leaves). After riding my bike through the wind and the rain I came home and made a pot of this warming soup for supper. Heat oil in a large soup pot over medium. Add onions, stirring until onions are translucent. Add cauliflower and continue cooking unit cauliflower is browning in spots, about 5 to 8 minutes. Add carrots, parsnip, garlic and dill and cook, stirring about 1 minute. Add water, turn the heat to high and bring to a boil. Reduce to a simmer, cover, and cook until vegetables are tender–about 20 minutes. Remove from heat. Season to taste with salt, pepper, and nutmeg. 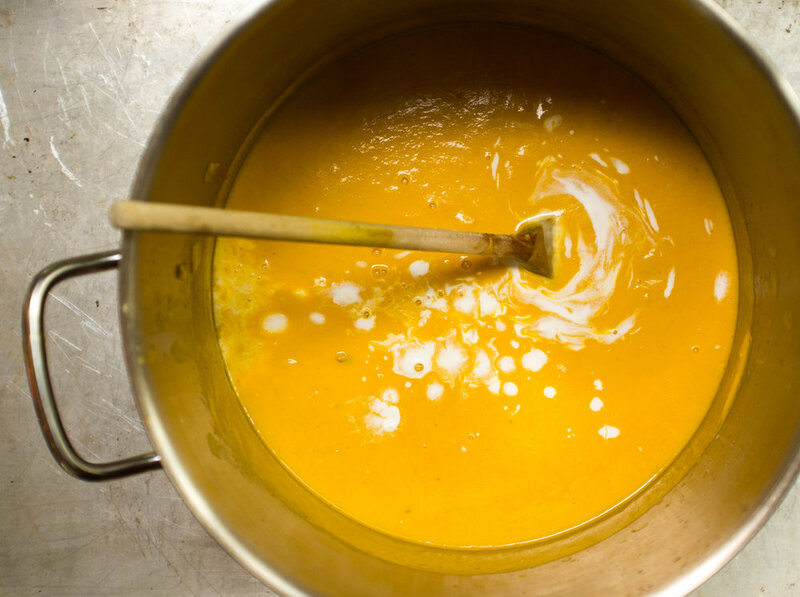 Using a handheld immersion blender or a regular blender puree soup (if using a regular blender do this in small batches). Remove the corn from the cob and add to the soup. Adjust seasoning is necessary, I often add more dill at this time. Bring back to a simmer and serve with fresh chives, (if using). The power of soup is strong. I was in the kitchen as a volunteer, at Holy Blossom Temple to help prepare soup to bring to people in need of some warmth over the winter months to follow. I was so surprised how quickly 28 woman can work together to make soup. Keeping us stirring the pot was guest chef, food writer, and author Lucy Waverman. While the soup simmered Rabbi Karen Thomashow stirred a little spirituality into the evening, leading a discussion about the mitzvah of Bikur Cholim. I went home with 2 new soup recipes and the knowledge of how something so simple like soup can bring people together! The power of soup is strong. Last week over 40 thousand people gathered at Woodbine Park for Soupstock, a one-day celebration that features soup created by over 200 Canadian chefs to raise funds to support community action against the Mega-Quarry. Two of those chefs are friends of mine, Lisa Kates, aka A Food Gypsy and Joanna Sable, from Bumpercrop, both are cooks extraordinaire. Lisa made a rich caramelized beer onion soup topped with Bumpercrop’s Cameron’s Beer Onions and baguette from Knead Bakery. 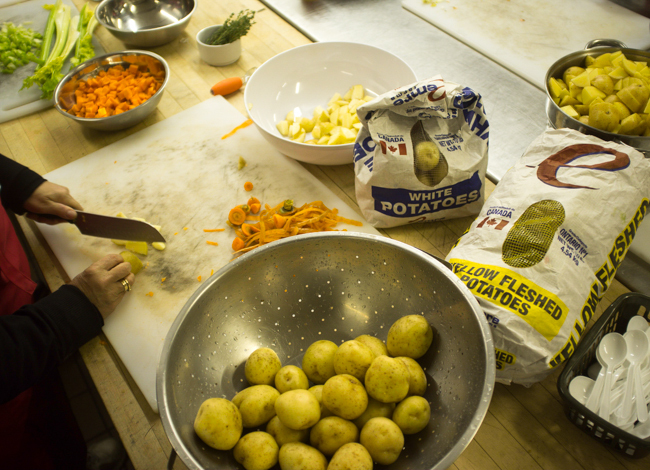 A group of us volunteers met at The Depanneur, a cozy little spot in the Junction to do our cooking, we came to peel onions, chop onions and caramelize onions. I went home smelling like an onion! 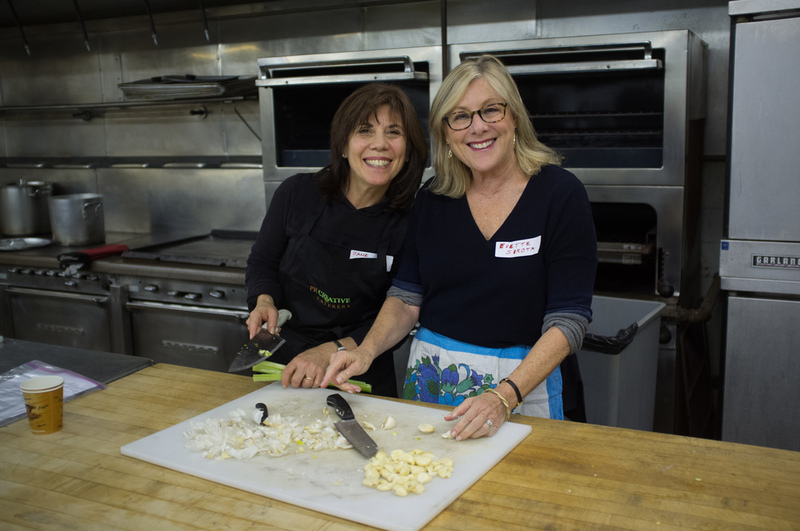 Lisa Kates and Gail Gordon Oliver, from having some fun at the Dep while the onions simmer. In large soup pot, on medium heat, add oil. Sauté onions, carrots, celery and garlic for 2 minutes or until softened. Add tomatoes, herbs, chili flakes, stock, spinach, zucchini and pasta. Simmer for 10 minutes. Add beans and simmer 10 minutes longer or until pasta is tender. Season well with salt and pepper. Serve with grated parmesan. The sweeter the pears, the more heat and acid you need to balance the taste. Heat oil in a pot on medium heat. Add onion, carrot and celery and sauté for 1 minute. Add sweet potato, pear and thyme and sauté about 2 minutes. Add paprika and chicken broth. Bring to boil and simmer for 15 minutes or until sweet potato is soft. The trees are changing colours. 1 medium butternut squash (about 2 pounds) – cut into cubes. Heat oil in a large pot over medium heat. Add onion and bell pepper, and cook, stirring frequently, until soft, about 5 minutes. Add garlic and cook, stirring, a few more minutes. Stir in beans, tomatoes, chiplotes, chili powder, oregano and salt. Add cubes of butternut squash. Continue cooking, covered for 30 minutes or until squash is tender. If you want to add some ground meat (1 lb) to this chili, cook the meat with the onions and bell peppers for about 10 minutes or until the meat has browned. If you like a thicker chili, you can puree one or two cups in the blender and then add back to the pot. If you have the time make the chili early in the day so the flavours have time to develop. Do you love mushrooms? I do! Whenever I make this soup I am often asked for the recipe. You will be surprised how easy it is to make. I love how simple recipes can taste complex. You can make this soup a day in advance of when you want to serve it. This gives the soup some time to develop great flavours. And if you really want to up your soup into pretentious (but deliciousness), drizzle a few tiny drops of truffle oil over the soup just before serving. And please do not omit the dried wild mushrooms, they are loaded with earthy flavour and are an essential to this soup. I use a mix of dried porcini, oyster and shiitake. You can usually find dried mushrooms in the produce section in small packages. So, invite some friends over and enjoy this soup with people you love! In a large saucepan, melt 2 tablespoons butter or olive oil over medium heat and add the onion, celery and garlic. Cook for 5 minutes until the onion is soft and translucent. Then add the fresh mushrooms, dried mushrooms (with the water they were soaking in, taking care not add any of the dirt which may be in the bottom), carrots and more oil or butter if necessary. Let the mixture cook over medium heat for about 8 to 10 minutes taking care that the onion doesn’t take on any brown colour. Stir in the water and bring to a boil. Immediately reduce the heat and simmer (covered) for about an hour. Let soup cool for a few minutes then transfer to a blender or food processor and carefully blend at high speed until smooth. Do this in stages and remember to hold the blender lid down. When blended, return the mix to the pot, season with salt and pepper, and bring up to a simmer again. Add the sherry, mix well, and serve immediately with a drizzle of truffle oil and a sprinkle of fresh chives. I love this recipe. It comes from The New Basics Cookbook by Julee Rosso and Sheila Lukins, authors of The Silver Palate Cookbook, http://shop.silverpalate.com/. I think the secret to this recipe is my 20lb cast iron yellow Calphalon dutch oven. Thank you Judy, (my sister in law) for carrying it home in your suitcase from Naples Florida, I think of you every time I make this recipe! My Calphalon Enamel Cast Iron 5 Quart Dutch Oven in custard yellow. In an ovenproof casserole or dutch oven sauté the bacon until crisp. Remove the bacon with a slotted spoon and drain on paper towels. Pour off all but 2 tablespoons of the bacon drippings. Sauté the beef in the bacon fat in small batches, until browned on all sides. Add the wine, the beef stock, the tomato paste, the bacon and rosemary. Loosen any bits of food from the bottom and sides of the pot and bring the mixture to a boil. Cover and place in the oven to cook until the meat is tender, about two hours. To prepare the vegetables, bring a small pot of water to a boil and drop in the carrots, boil until tender for 5 to 7 minutes, drain and rinse under cold water. Reserve. If you are using frozen pearl onions you just need to defrost them, if you are using fresh pearl onions make a small X in the root end of each pearl onion, fop into boiling water and cook for 5 minutes, drain and rinse under cold water. Reserve. Slice the mushrooms, and cook in about 1 to 2 Tbsp of melted butter, sauté over medium heat for 10 minutes. When the meat is cooked, add the carrots, onions, mushrooms and currant jelly. Put back in the oven and heat through about 10 minutes.